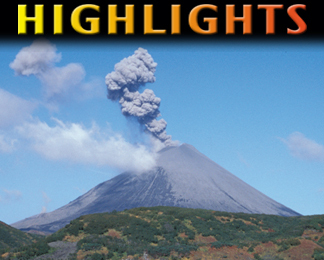 The annual Geotimes Highlights issue offers reviews of trends, discoveries and research in the earth sciences. Click on the above image or here to link to our special online index of stories. The American Geological Institute gathered geoscience leaders in Washington, D.C., to find new opportunities for alliance. At retirement, geologist Robert Spoelhof finally learns what he wants to be when he grows up. Karymsky is an active volcano on the Kamchatka Peninsula, Russia. Please see story. Photo by Jonathan Lees, University of North Carolina at Chapel Hill.